Caramel Apple Bread Pudding is a dish that is perfect for when you want to serve a dessert that will impress. I love making a good old-fashioned bread pudding. They are easy to make, and they taste, oh so good. If you haven’t had a chance to try Opal Apples, this is a good opportunity to try this special apple. If you haven’t had a chance to try an Opal apple, I will encourage you to find these apples. One of the characteristics of these apples is that they don’t brown. We all know that when you cut into an apple, they brown. These don’t brown because of the natural properties of this apple. They are also the first apple that is Non-GMO certified. So if you are concerned about GMO in your food, this apple is one that you will enjoy. These apples are crisp, sweet, and they lend themselves to baking. They do not get too soft and stand up well. I think these would also make fantastic applesauce, apple dumplings, cocktails, and of course, my bread pudding. This bread pudding is made with leftover French bread. I like to buy day-old bread and turn it into bread pudding, it has a nice dense texture, and it is perfect. If you don’t have any French bread on hand you can use brioche, Italian, challah, croissant, or panettone. I suggest something hardier than your everyday sandwich bread. This bread features cinnamon; this cinnamon bread is baked in a creme anglaise, and then served with a rich caramel sauce. You are bound to fall in love with this bread pudding. I like to serve this bread pudding while it is still warm and fresh from the oven. It does reheat well, so if you can’t enjoy it in one sitting, you can reheat it and enjoy it later. For this recipe, I suggest that you use a water bath. We bake delicate foods such as a bread pudding because this will keep the bread pudding from burning or drying out. It is key to use two pans for your water bath, one large shallow dish, and then the baking dish with the bread pudding. You may want to also place a dish towel into the larger pan, so the smaller pan doesn’t move around in the pan. To make the water bath set the smaller pan into a larger pan and fill about halfway with water, this is the right amount of water in the water bath. You will want to check during the baking to make sure the water does not evaporate during the cooking. 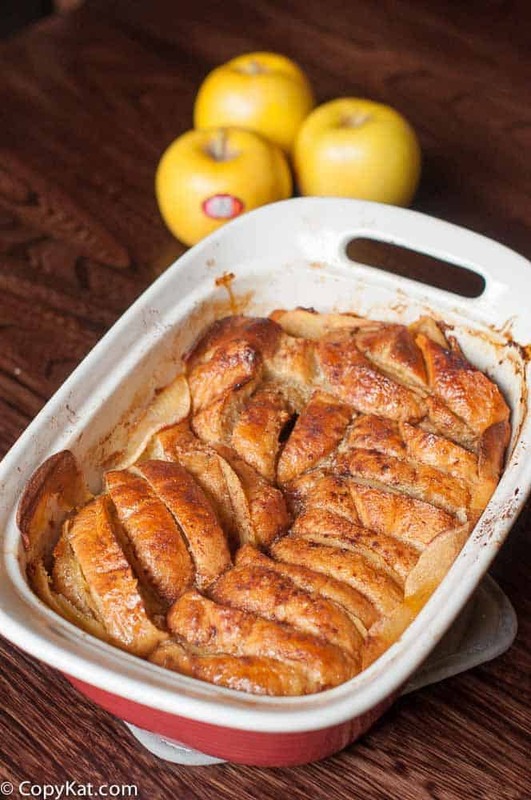 Apple bread pudding is so moist and flavorful. Top apple bread pudding with homemade caramel sauce. Preheat oven to 375 degrees. Wash, peel, and core apples. Slice apples thin, this works well with a mandoline. Combine sugar and butter in a bowl, mix until well blended. Cut bread into 3/8 inch slices. Spread the sugar and butter mixture on the bread. Make small sandwiches of the bread by using two slices of buttered bread, place 2 or 3 apple slices in the middle with a sprinkle of cinnamon. Butter a 9 x 13-inch baking dish. Place the butter sandwiches into the baking dish, between each sandwich add 1 or 2 slices of apple. Heat up the cream and the vanilla bean on the stove until it almost starts to boil. Meanwhile, combine the egg yolks and sugar in a bowl and whisk well. When the creams reach the almost boiling point, turn off and remove the pot from the flame. Temper the yolks, by ladling a small amount of cream to the bowl and mixing well. Then add the yolk-sugar mixture to the cream, whisk well so that it does not curdle. Place over a low flame for 2 minutes whisking until it starts to thicken. Pour sauce over the bread in the baking dish, cover the dish. Place the 9 x 13-inch baking dish into a water bath, and bake for approximately 40 minutes. Remove cover and bake uncovered for 10 minutes. While the bread pudding is cooking in the oven prepare the caramel sauce by combining the sugar and butter in the pot and cook over a medium-high flame. Whisk well to combine, when sugar is melted and it starts to boil turn off the stove, remove from the flame and whisk in the cream to combine. Allow cooling to room temperature. To serve place a portion of the bread pudding on a plate and drizzle with the caramel sauce. Oh, wow! This looks incredible! i love the combination of apples and caramel! A match made in heaven! What is the best substatuion for Opal apples? They do not sell/carry them where I live. I have used Golden Delicious and Granny Smith to replace these. I use equal amounts of each apple. I haven’t tried an Opal apples, but will definitely be on the lookout for them. This bread pudding is so pretty to look at, and I’ll bet it tastes even better! These are fantastic apples, I love that they don’t brown.